4-star-hotel in the 11th district of Budapest. The hotel has 40 rooms. 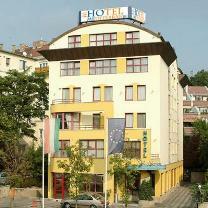 Hotel Mediterran is a 4-star hotel in the heart of Budapest, at the foot of Gellért Hill, 2 km from the city center. The hotel is opposite the Budapest Congress & World Trade Center. The brand new 4 star Hotel Mediterran is located in the heart of Buda, where the M1-M7 motorways are reaching the city. Due to the favourable location and outstanding parking availability it is an ideal venue for travellers arriving by bus or car from Vienna or the Lake Balaton. Budapest Convention Centre and the MOM-PARK (a new shopping-, entertainment- and business centre) are within walking distance. The downtown is easily accessible by car by public transportation (bus No.8 or 112) or even walking ( appr. 30 minutes). The Hotel Mediterran is air-conditioned, supplied by the latest technical equipment, nicely furnished and it has really a Mediterranean atmosphere. All the 40 rooms are with private bath. In-room facilities are: hairdryer, minibar, safety deposit box, telephone with computer and Internet plug, colour television with cable channels and pay-TV. The windows are soundproof and you can enjoy the nice view on the Buda Hills. Non-smoking and connecting rooms are available. The Drink-bar in the lobby on the ground floor has a pleasant atmosphere. This is an intimate and friendly meeting point. One can enjoy here the world-famous Dallmayr espresso / black coffee and the Paulaner draft beer. The restaurant and summer terrace offers the delicacies of the international gastronomy. The garage provides perfect security for your car. 24 hours concierge service.